Many of us who have been gaming for years remember being faced with the dreaded “blue screen of death” from time to time. We didn’t know as much about computer hardware back in the day and there was little else that could send you into crisis-mode quite like that scenario could. And what was usually the problem? Overheating. Top-quality gaming systems these days aren’t cheap. We enjoy our gaming very much so we’re very invested in taking care of our systems to the best of our ability. 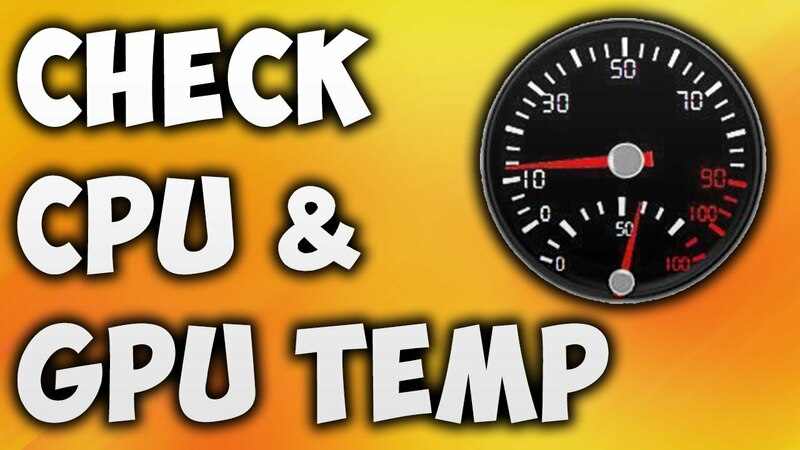 If you suspect your system is running hotter than it should, or you want to be a responsible owner and monitor CPU and GPU temperatures, here’s what need to know. We’re talking about how to monitor the temperatures, what those temperatures should be, how to identify possible causes of overheating, and what to do when your system overheats. The bulk of today’s gamers will be choosing between AMD’s Ryzen series and the Intel Core series for their CPU. The highest safe temperatures these companies list for operation is 95 to 100 degrees Celsius. It’s not likely you will reach those without a cooling issue or the clock being pushed further than what the cooler can manage. Optimal temperature levels in general today are different than they once were. Processors today are far more powerful and that being the case, the temperatures are going to be higher than they were in the past. High-powered processors like Intel’s Core i9 series will have a higher CPU temperature. The common use of silicone in chips today also has an effect on temperatures. The higher the quality of the silicone, the lower the temperature. Today, the optimal CPU temperature should be somewhere between 30 to 50 degrees with an ambient temperature of 40 degrees or higher. Lower than 30 degrees can be good also, depending on the ambient temperature where your computer resides. When it comes to loading temperatures, anything from 60 to 80 degrees is considered ideal. Anything beyond that can initiate thermal throttling. Two major manufacturers produce the bulk of today’s GPUs. AMD and Nvidia design and produce GPUs but the graphics cards themselves are typically made by other companies like Asus, EVGA, Gigabyte, MSI, or Sapphire which makes the cooling issue a little more complex. The producers of graphics cards usually integrate their own cooling methods. The ideal GPU temperature range isn’t so different from that of CPUs. It’s important to remember that today’s GPUs are cooled passively until a given load is reached. With passive cooling, fans aren’t used which can sometimes lead to a higher idle temperature. When it comes to upper range, temperatures shouldn’t exceed 80 degrees. At that point, thermal throttling begins and your system might lose some of its efficiency. When you bought the system a couple of years ago, it likely didn’t go over 65 to 70 degrees but now exceeds 80 degrees. Why is that happening? The most likely culprit is the thermal compound installed on the dye. Higher temperatures can indicate that it’s not as efficient and must be replaced. Just be aware that you can handle the replacement, but you will likely void your warranty once you’ve opened the GPU to change out your thermal paste. Most graphics cards today include smart fan technology. The fans only run when the temperature passes a certain level, usually somewhere between 30 and 40 degrees to conserve energy. This also keeps down the amount of noise the fans make. The card may seem warmer than they should during the times the fan is idling. Monitoring is easy today thanks to the onboard sensors used by CPUs, GPUs, and motherboards and through a variety of specialized software. The following can be used to track CPU and GPU temperatures. BIOS is the easiest way to check not only your temperatures but other important values within your system. Restart your PC and press the Delete key during the boot-up sequence to access BIOS. It’s a great way to check on things if you don’t have to do it often since you’ll have to restart each time you access the utility. Most CPU and GPU brands like AMD, Intel, Nvidia, and others come with onboard utilities for great convenience. Remembering most CPUs are either AMD or Intel, you’ll likely be using either the Ryzen Master Utility or Intel’s Extreme Tuning Utility. Both programs feature useful insights on different system specifications, allowing you to see your current CPU temperature and other helpful data. Since most GPUs are AMD and Nvidia, you’ll likely be accessing either the AMD Catalyst Control Center or the Nvidia Control Panel which will let you see the current temperature of your card along with a lot of other useful data. The hardware makers also include utilities like Asus GPU Tweak, Gigabyte Aorus Graphics Engine, and MSI Afterburner that basically do the same thing. HWMonitor: There are many reasons that HWMonitor is first on the list. It offers a simple, easy-to-use interface that allows you to monitor the performance of several system elements in addition to CPU/GPU temperatures. It’s brought to us by the folks at CPUID who developed CPU-Z and PC Wizard and it’s free to use. AIDA64 Extreme: AIDA64 Extreme is a powerful little tool. It’s an inclusive system analyzer that has a lot to offer on top of CPU monitoring. You can monitor your GPU performance, component stress testing, activity indicators, and RAM for insights on many types of potential issues. For all the information it provides, it’s pretty straightforward and easy to understand.AIDA64 Extreme has a free version but to get all of the features it offers, you’ll have to buy the full version which is reasonably priced for what you get. Real Temp: If your system is using an Intel processor, Real Temp might be the best CPU monitoring program to go with. It’s portable so you don’t even need to install it. Just run it and go. It’s developed specifically for Intel products and works great with dual core, quad core, and single core along with the i5 and i7 series. Displayed temperatures are in real-time and include the maximum and minimum temperatures of your system’s processor since you started it. There’s also an alarm for high temperatures so you can deal with overheating situations right away. Rainmeter: Rainmeter is actually a free, versatile tool for customizing your desktop that includes CPU temperature monitoring. It provides a lot of useful data on your desktop including CPU and RAM usage, disk usage, temperatures, and more. It offers you a choice of skins and those individually have some great features included. The default skin, for example, displays just the CPU and RAM usage. There are various places to download skins and it’s easy to find one to display the data you want to see. SpeedFan: One of the most popular monitoring tools, SpeedFan is used widely by those running Windows 8 and 10 operating systems. The program itself predates Windows XP but it’s dependable and accurately monitors the temperature of your CPU. It also lets you monitor voltage and fan speed. Ambient Temperature: Is the ambient temperature of the room where your system resides high? Your system can’t operate at a temperature lower than that so if your ambient room temperature is already high, your system’s temperatures will be elevated as well. Dust: Dust buildup is a common culprit in system overheating and it degrades the cooling performance of your system drastically. The best course of action is not waiting for your system to overheat before you clear it of dust. Clean your system regularly and keep it dust-free. Failing Cooling System: The cooling system of your machine is composed of several different components that work together to keep everything cool. So when something in your cooling system is the cause of overheating, evaluate the entire cooling system, each component, to identify which part is malfunctioning. Poor Airflow: Poor airflow is actually common. There are some aesthetically-pleasing new cases available but it doesn’t mean they are providing the system with the airflow it needs to keep the system at recommended temperatures. Chose a new system or casing carefully and ensure that the casing doesn’t choke off the fans or degrade potential airflow to begin with. If you live in a warmer climate, particularly during hot summer days, you may be limited as to what you can do with a higher ambient temperature. Ensure your cooling system is in optimal performing order and disable any power-saving or silence modes so there’s not a time when your cooling system is idle. If conditions are such that the existing cooling system is insufficient to maintain proper temperatures, you may have to upgrade your system. It’s important to periodically clean your heatsink to ensure you don’t develop substantial dust buildup inside. It’s important to keep you entire system clean and free of dust buildup for optimal performance. It’s important to periodically check your system’s airflow to make sure CPU and GPU fans are getting the amount of cool air they need to run through the heatsink. Many resolve this issue by installing case fans, one at the front to pull in cool air and one at the back to expel hot air. If your casing doesn’t support such a setup, a single front-mounted fan could be used anywhere on the case and provide enough relief to remedy the situation. In a pinch, the computer case can be opened to prevent internal heat buildup until a proper cooling solution can be implemented. If you’ve tried and checked everything presented here and you’re still dealing with higher than normal temperatures, there’s a possibility that there’s a defective hardware component in your system. Unless you are a hardware expert yourself, your next move would be to take your system to a trained and certified technician for help on diagnosing your system’s overheating issues.